We've been in the prognostication business of late, and have gathered a great deal of data on the Tucson commercial real estate markets in one slide deck. Earlier this week at the annual Tucson BOMA/IREM Economic Forecast Breakfast, we overviewed the Tucson office, retail and industrial markets, and painted a picture of cross-border real estate activity in the Arizona/Sonora region. Click the image below to access the full slides. 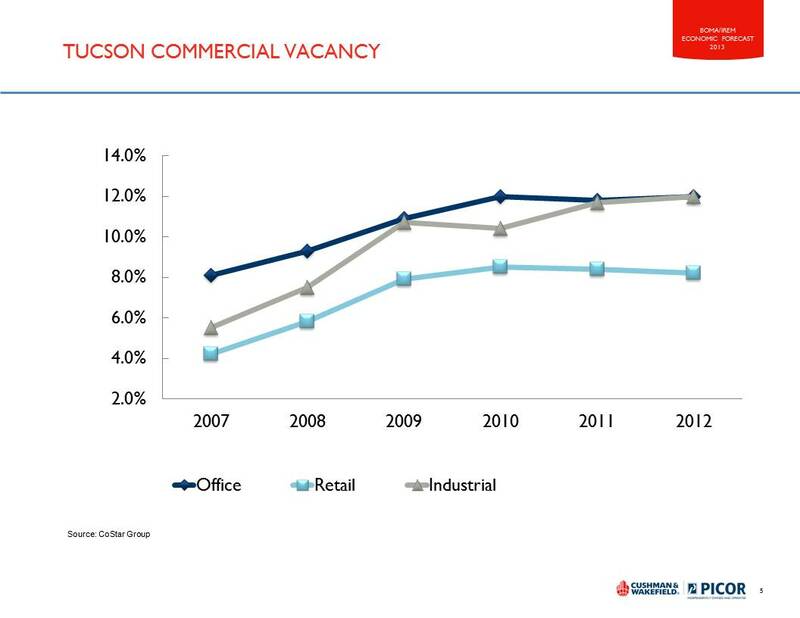 In short, 2012 was a transition year for Tucson's commercial markets, and for many of us, 'fun' returned to the marketplace by year end. Uncertainty shifted to stability, as all three primary sectors (office, retail and industrial) experienced positive absorption in 2012. While fundamentals firmed and continue to improve very gradually, no significant pressure exists to move values, lease rates or fuel demand for speculative construction. Expect slow improvement in occupancy, lease rates and absorption. With health in the Phoenix commercial real estate markets and a stronger showing for Tucson residential real estate, signs point to a continued uptick. Construction will be largely limited to user-driven projects, while we expect renovations to increase. Look for more development activity along the Tucson Modern Streetcar line, and a continuation of the downtown renaissance. Cross-border commerce between Arizona and the State of Sonora, Mexico, our bordering state, should continue to blossom in 2013, and Tucson is well poised to attract employers to ready sites such as Port of Tucson, UA Tech Park, Rockefeller Group Distribution Center, the Lisa Frank facility, and Aero Business Park. 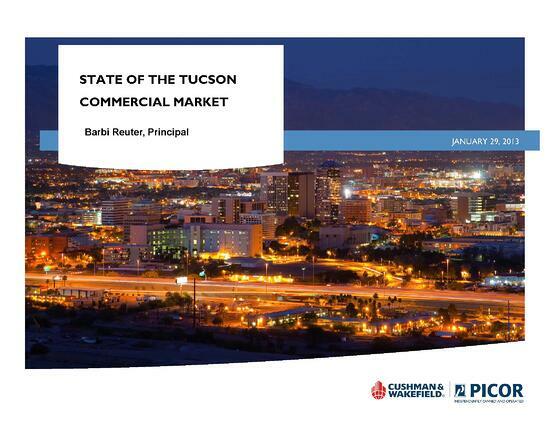 If you missed our State of the Tucson Market Webinar which includes audio commentary on these markets plus the Tucson multifamily market, click here for the archive and click here for the slides. You may also download individual market sector reports from our website - scroll down to 2012. Barbi Reuter, RPA oversees Cushman & Wakefield | PICOR’s operations, research, finance and marketing/social media activities and serves as Associate Broker. One of 13 company Principals, she is active in industry and community leadership, through such organizations as Commercial Real Estate Women (CREW), Greater Tucson Leadership, Arizona Town Hall, and board work for the Tucson Girls Chorus and PICOR Charitable Foundation. In 2012, she was named a Woman of Influence by Inside Tucson Business.